from commercial offers made by a public entity to another public entity held as collateral by a creditor with private and solvent standing in law. Majesty Akahi Nui, Holder in Due Course, is the BAILOR in all issues at hand. The Secured Party in this filing is the Holder in Due Course and holds the only clear Title and Deed to the private property described as: 9 Firebreak Road off Mokulele Hwy; TMK# 3-8-008-019-0000, 86.029 acres/sq ft: and at Zone-(3) District-(8) PUUNENE-AIRPORT (TMK(2) 3-8-008-019 Doc# 2002-005579 through 2002-005580 TMK (2)-1 through 6 ALL-ALL-ALL (ROYAL PATENT DEED) and is also found within the Royal Titles within Financing Statement No. 2007-287-2418-3. The Financing Statement filed on October 31, 2007 listing A&B HAWAII INC., subsidiary of ALEXANDER AND BALDWIN INC., is secured by consent, agreement and permission by the following listed parties and is the result of said Parties entering into DEFAULT and Non response.
. ACTING GOVERNOR LINDA LINGLE was served with an AFFIDAVIT OF NOTICE OF DEFAULT AND OF RES JUDICATA Item# 11177/KOH on September 5, 2008. Paragraph 8 of said Affidavit of Notice of Default states, "... Linda Lingle, through your dishonor and default you have admitted and confessed to your own fraudulent and unconscionable actions as well as those of ALEXANDER & BALDWIN and THE STATE OF HAWAII who you've acted on behalf of. And by your dishonor and default, you, Linda Lingle as acting governor agreed that...(and) ALEXANDER AND BALDWIN (A&B)... does not hold and possess any lawful titles and are not the Holder in Due Course of Lawful Superior Titles... . And you have agreed and given permission for a lien to be filed against yourself... and ALEXANDER & BALDWIN (A&B) for said fraud, injury, default and dishonor for damages incurred..."
Paragraph 9/ AFFIDAVIT OF NOTICE OF DEFAULT; states: "...agrees and confirms that ALL land and soil... including but not limited to the land parcel addressed as 9 Firebreak Road in Kahului, Hawaii is held in trust by the Kingdom of Hawaii Nation Ministry Trust..."
1(a). Held is a CERTIFICATE OF NON RESPONSE AND FAILURE TO CONTEST (AFFIDAVIT) signed by the Third Party Notary and Witness documenting that Linda Lingle failed, neglected and refused to respond to the Private Administrative Process within the time stipulated, failed to cure the fault and documenting the presumption being made that Linda Lingle is in full acceptance and in full agreement to all matters as stipulated in favor of His Majesty Akahi Nui and Akahi Wahine as documented. Please note: If a U.S. citizen's collateral is lawfully held as "debtor" by a third party with a superior claim pursuant to a security agreement and said security interest is perfected under the U.C.C., then no government, state body politic, or any party in commerce can state a claim upon which relief can be granted. All standing in law is based on the Right of Interest held to state and enforce a claim.
. CHARLES LOOMIS, Attorney/ Representative for A&B (ALEXANDER & BALDWIN INC) was served with his AFFIDAVIT OF NOTICE OF DEFAULT on March 31, 2008. Mr. Loomis Defaulted in a Private Administrative Process as the representative for A&B and by his dishonor, admission, confession, injury and damage and failure to state a claim, consented and gave permission for a lien to be filed on himself and ALEXANDER AND BALDWIN INC (A&B) for damages that his own reckless actions incurred. This Private Administrative Process was followed by a Tort Claim wherein Mr. Loomis again went into Default. Mr. Loomis was also served with his Affidavit In Support Of Claim Of Lien Affidavit Of Obligation which was also forwarded and sent to ALEXANDER AND BALDWIN INC(A&B). By acquiescence and default Mr. Charles Loomis is in agreement that ALEXANDER AND BALDWIN (A&B Inc) DOES NOT hold and cannot produce a lawful title superior to that held by Majesty Akahi Nui.
. DEBORAH K. WRIGHT, ATTORNEY/ REPRESENTATIVE FOR A&B (ALEXANDER AND BALWIN INC), was served with an AFFIDAVIT OF NOTICE OF DEFAULT on March 12, 2008. 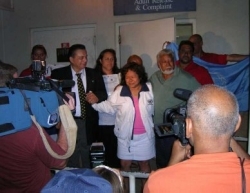 She was served with the NOTICE OF TORT AND TORT CLAIM W/EXHIBITS on February 25, 2008 after going into Default in a Private Administrative Process wherein she as a representative of ALEXANDER AND BALDWIN (A&B) agreed and consented for lien to be placed on herself and A&B who she acted on behalf of and based her actions in which caused personal and commercial injury and damage. 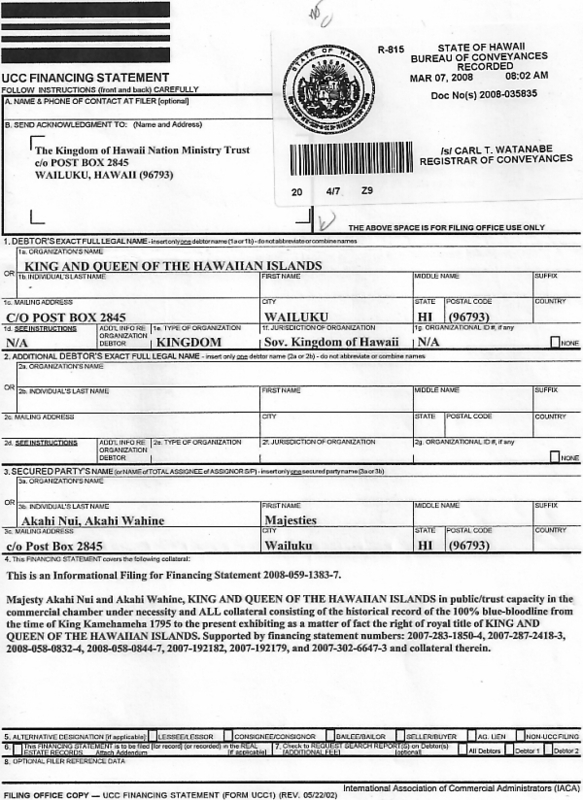 By acquiescence and default Mrs. Deborah Wright is in agreement that ALEXANDER AND BALDWIN (A&B Inc) DOES NOT hold and cannot produce a lawful title superior to that held by Majesty Akahi Nui.
. JASON KOGA, A&B PROPERTIES (ALEXANDER AND BALDWIN), was served with his AFFIDAVIT OF NOTICE OF DEFAULT AND AFFIDAVIT IN SUPPORT OF CLAIM OF LIEN / AFFIDAVIT OF OBLIGATION on March 31, 2008 after he entered into Default in a Private Administrative Process wherein he agreed and consented to a lien being placed on himself and A&B who he acted in behalf of and in which damages were incurred. Jason Koga was served with a follow up Tort Claim and willingly entered into Default. By acquiescence and default Mr. Jason Koga is in agreement that ALEXANDER AND BALDWIN (A&B Inc) DOES NOT hold and cannot produce a lawful title superior to that held by Majesty Akahi Nui. The security agreement was established in this matter by and through A & B's representatives and agents 'silent tacit agreement', default and dishonor, also known as 'agreement of the parties'; by definition under the UCC are "rights to payment under contract - - not yet earned by performance"; this converts what might be a worthless promise into a legal obligation making it subject to transfer by assignment. On a side note, what does the State of Hawaii produce and provide as found in their records of the security agreements that the State obtained from the individual people in order to file a lien on the individual people, say for un-paid taxes or any other matter? Would you or the State agree that the lien process is adversarial in nature, but also to state a claim and establish a superior security interest under necessity? 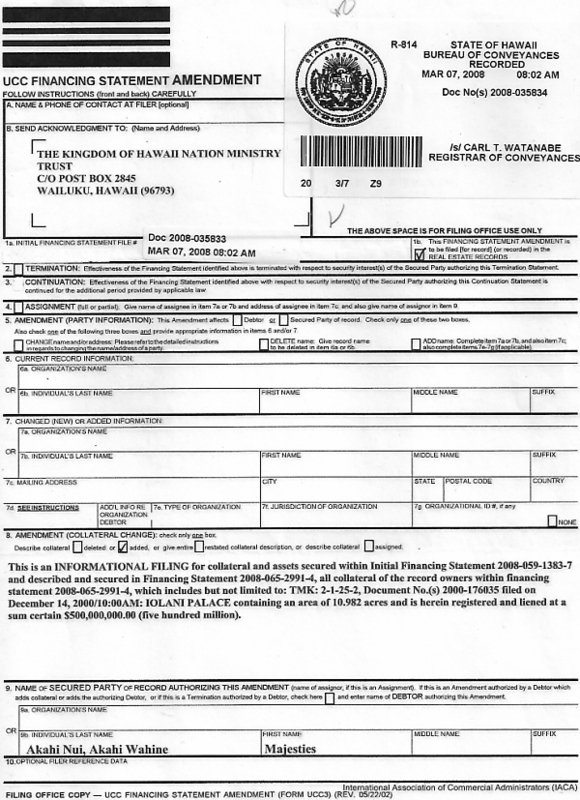 Please be advised that I, as King's Legal Counsel on behalf of the Sovereign Kingdom of Hawaii, herein declare a 'Letter of Interest / Claim of Right' / and a Money Claim as against the STATE OF HAWAII, A & B CORPORATION and its agents and representatives as asserted in said Financing Statement as indicated above. 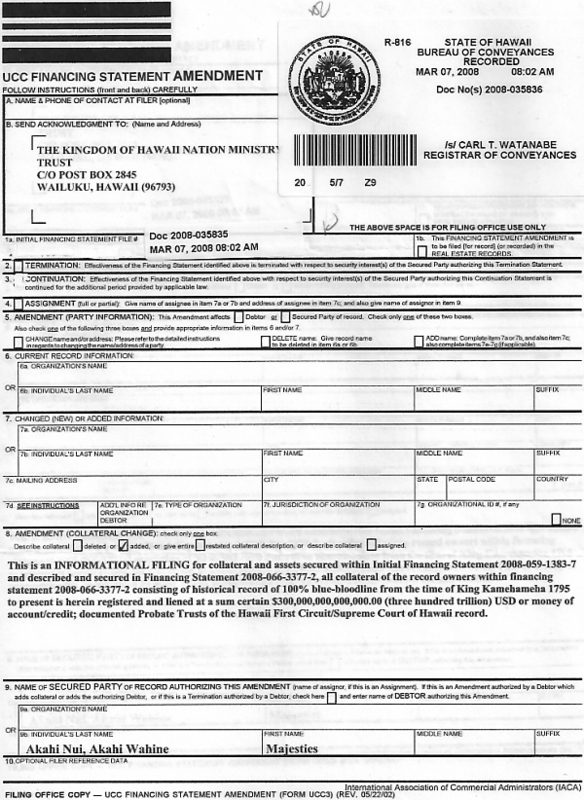 Also, please be advised that the Trustees for The Kingdom of Hawaii Nation Ministry Trust do not agree nor consent to your attempt to stultify this private matter between The Kingdom of Hawaii and A&B Corporation and per your acts to do so, will require that you post a $50,000,000.00 (Fifty Million Dollar) Bond to indemnify your involvement in this private matter.